Service dogs for people with psychiatric disabilities and mental illnesses play a complex role in society and struggle for legitimacy. Hopes&Fears meets with the trainers of the canine companions most qualified to deal with the nuanced needs of people with PTSD and other "invisible" disabilities. On an overcast Wednesday morning in Dobbs Ferry, New York, Lu and Dale Picard greet us at the door to the center for ECAD, or Educated Canines Assisting With Disabilities. 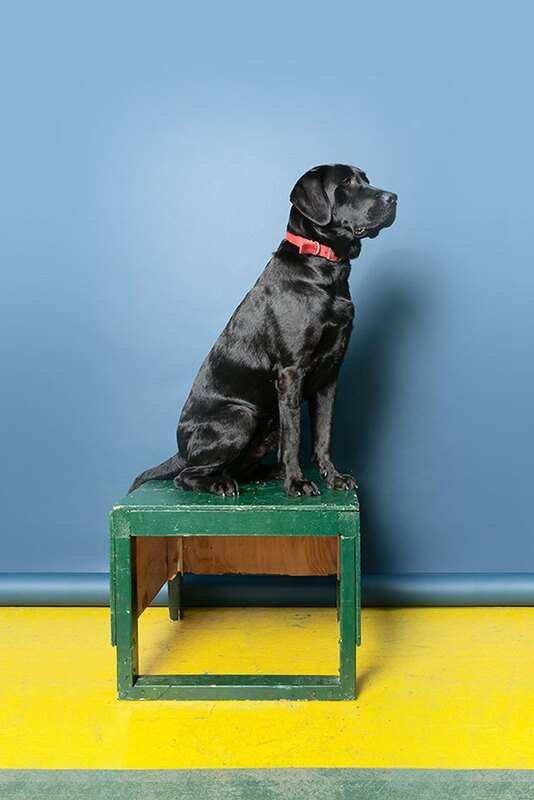 The Picards founded the nonprofit organization in 1995 to train service dogs for people with different disabilities, from children with autism spectrum disorders to people with Parkinsons. Of the 300 dogs the Picards have bred, trained, and looked after, 40 have been for veterans suffering from Post-Traumatic Stress Disorder. While service dogs for people with physical disabilities are readily incorporated into our society, service dogs for people with psychiatric disabilities or, as Dale puts it “invisible disabilities,” like PTSD have yet to see the same acceptance. Service dogs weren’t always an option for those with psychiatric problems or brain injuries, but these programs have gained a certain momentum over the last decade. “When it came up big time was during the wars in Iraq and Afghanistan. That’s when it started becoming popular,” Dale notes. ECAD (Educated Canines Assisting with Disabilities) was founded in 1995 by Lu and Dale Picard. ECAD's mission is to educate and place Assistance Dogs to help people with disabilities gain independence and mobility. 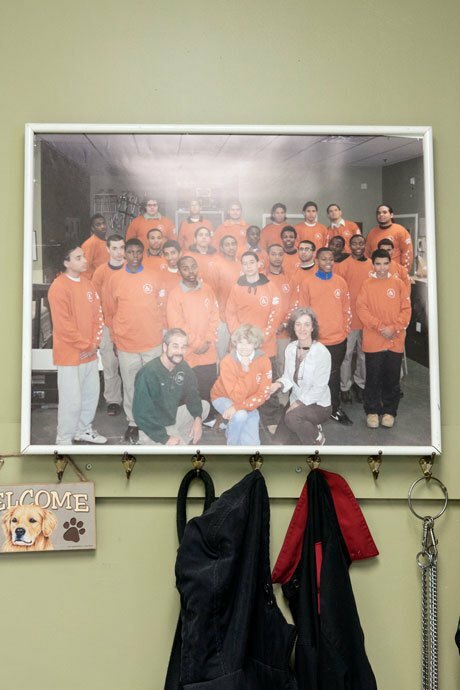 ECAD has placed over 200 dogs, in over 25 states, which is made possible by more than 750 teens that have participated in their ECADemy Program. There are over 60 dogs in training at one time and over 30 people waiting to receive a dog. The facility is located on the campus of The Children’s Village in Dobbs Ferry. Founded in 1851, the Children's Village helps children and families who are struggling become productive, independent citizens who will enrich their communities and their future families. 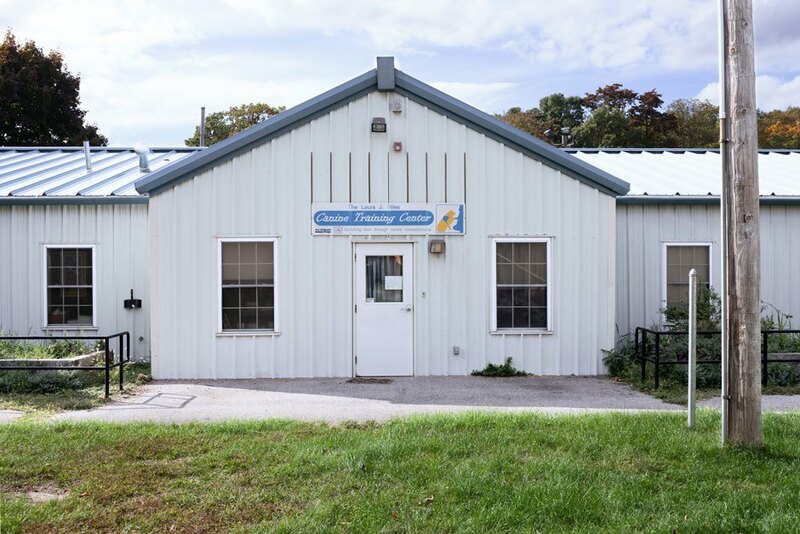 ↑ The ECAD (Educated Canines Assisting With Disabilities) facility located on the campus of The Children’s Village in Dobbs Ferry, New York. October 14, 2015. Valor is invaluable to Charles, but he isn't welcome everywhere. Around the country, instances of veterans being denied the right to enter public spaces with service dogs are all too common. Charles blames a lack of education. “People don’t understand the laws and the Americans with Disabilities Act. The resistance I get when my dog isn’t allowed into a space is, ‘What are you doing? You’re not blind.’” The stigma associated with identifying yourself as a person with a mental illness or a psychiatric disability can be further damaging. 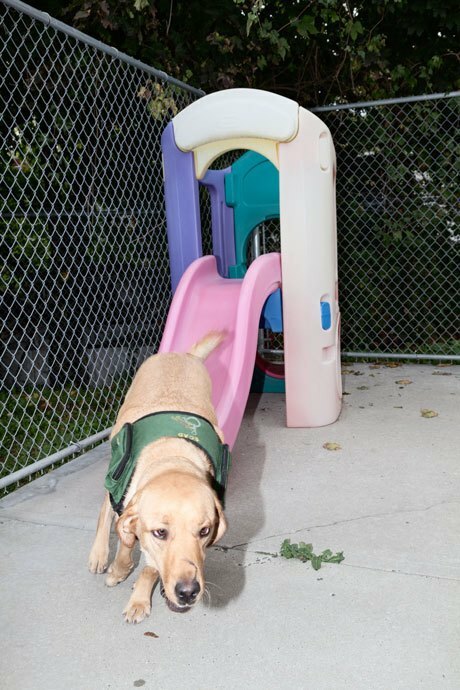 ↑ Yellow lab Champagne goes down a slide at ECAD on October 14, 2015. Support animals for children with psychiatric disabilities are typically trained to participate on the playground. 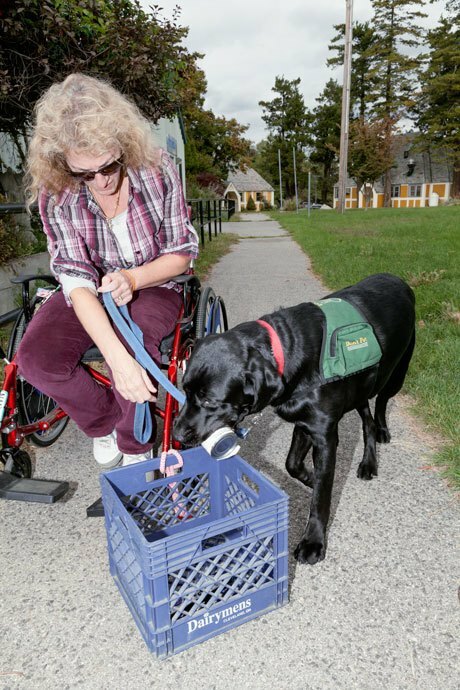 Brandy, a the black lab, pictured on the right, retrieves an aluminum can and other household items for ECAD co-founder Lu Picard, who is demonstrating typical tasks for support animals of people with physical disabilities. Teaching clients to communicate with their service dog, and to ask for various forms of assistance depending on their disability, takes two weeks. The dogs themselves are intensively trained for a long period of time. “Assistance Dogs International (ADI) requires service dogs to have a minimum of 300 hours, but for our dogs, it’s 1,500 hours,” Dale explains. It costs ECAD approximately $25,000, per dog which includes housing, educating, feeding, and covering the animals vet costs, which they fundraise for. 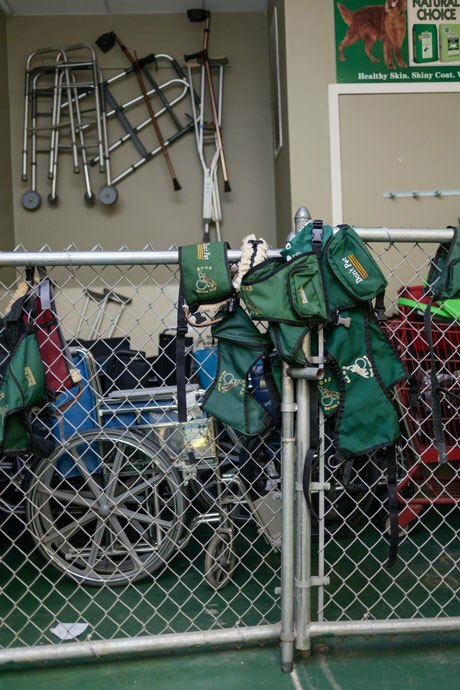 The ECAD develops their dogs as caregivers throughout their entire lives, but there are people without disabilities who simply want to exploit other peoples' need for service animals and game the system just to get their canines wherever they please. “Senior citizens with dogs in pet crates, lap dogs in pet crates sitting on airplanes, calling them emotional support dogs; it's confused the whole outside world as to what a service dog is,” Dale says. Others will try to sell untrained animals as service dogs. The Picards recently received a phone call from a dog warden in Florida. “A man was selling his dog claiming it was an ECAD service dog,” Lu recounts. “He sold it to a man, and this man called wanting to know if he could get a cape. I asked him, ‘What’s the breed?’ and he said ‘Oh, you know, it’s a little teacup poodle.’ I’m like ‘a teacup poodle’? How’s that taking care of you for your PTSD?” The Picards notified the local police department and threatened to press charges. ↑ Champagne received a scar on her nose from her mother Malibu, who became violent because of irritated mammary glands during nursing. Malibu had killed another one of her puppies in this process. While people with serious psychiatric disabilities and mental illnesses benefit from their service dogs, the service dogs don’t always benefit from their masters. What had been 90 minute vocational classes, teaching the kids to train and groom the dogs, has been all but eliminated due to budget cuts in the school system. “We’d spend 20 minutes a day teaching, 20 minutes a day grooming, about 40 to 50 minutes a day on training, with the last 10 to 15 minutes of class dedicated to just hanging out relaxing with your dog. They’re petting the dogs, getting themselves calm, and going back to class,” Dale told me. With school funding for the program dwindling, the Picards have had to refocus their mission on fundraising rather than teaching. But their dogs have had their days. In 2011, the Picard’s dog Rosie, a golden retriever therapy dog, was the first canine in New York to become judicially approved to sit in the witness box to help a traumatized 15-year-old girl testify against her father who had allegedly raped and impregnated her. 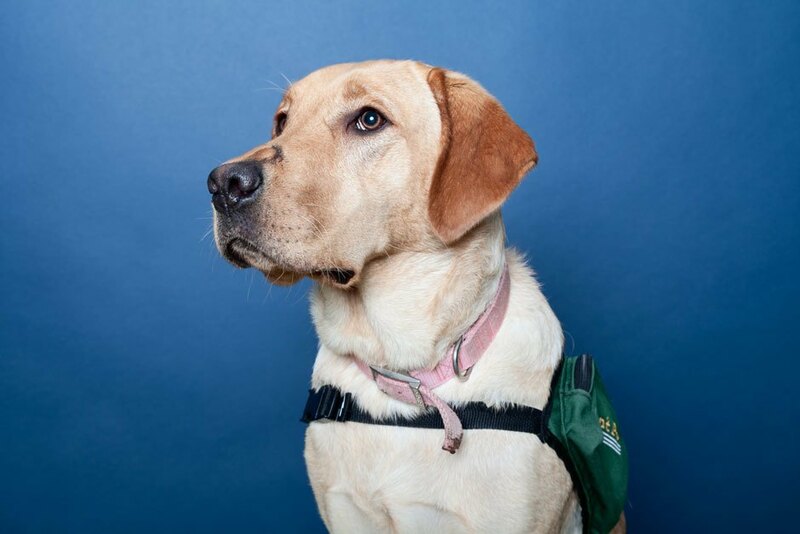 Rosie had helped the teen by nudging her when she was too scared to move and, in the process, sparked a national conversation about the use of service dogs in the courtroom. “My dogs have gone to see the White House,” Dale says, proudly. While the federal government and nonprofits around the country spend millions on experimental therapies between dogs and those with PTSD, the Department of Veterans Affairs still won’t cover the cost of these animals saying there is lacking research substantiating the efficacy of mental health service dogs. ↑ Dale and Lu's last full class from the Children's Village (left). Dale notes that three of these children lost their lives to gang violence after returning to their homes outside the treatment center. The capes ECAD provides to identify their service dogs (right). YES – Marks the exact moment the dog completes the task correctly. no – Marks the exact moment the dog fails to do the task or does something wrong. OKAY – Lets to dog know that one task is finished so that it can go on to another one. THAT'S IT – Let's the dog know he's on the right track and should keep trying. DOG'S NAME - Gets the dog's attention and lets it know that a command is coming. COME - The dog has to get close enough to touch you. LET'S GO - Tells the dog we're moving together. EASY - Tells the dog to be calm so he can focus on you. MY LAP - Dog should put its paws on your legs (used when sitting). SNUGGLE - Tells the dog you're going to hug him. OFF - Dog must put its feet back on the floor (not on an object or person). DOWN - Dog lies with its entire body flat on the floor. WATCH ME - Dog should make eye contact with you. FRONT - The dog positions facing your knees with its body lined up straight ahead of you. STAND - Only the dogs four feet are touching the ground. TURN AROUND - Dog faces the opposite direction. DRESS - The dog must put its head through the backpack or collar. KISS - Dog licks your hand or face. BEHIND – Dog positions with its body lined up straight in back of you. MOVE - Dog has to get out of your way, but not to any specific place. CLOSER - Dog moves in nearer to you. GO IN - Dog crawls into a small space, like under a table or chair. LEAVE IT - Dog must not even sniff, taste or even look at an interesting item. GO - Means that the command that follows will be done at a distance from the handler. FIX IT - Dog must untangle the leash from its legs. GO TO BED - Sends the dog to its own place or bed (there can be more than one). CORRECTION: An earlier version of this post had mislabeled "psychiatric service dogs" as "emotional support dogs."